The Gemological Institute of America (GIA) is nonprofit research institution and internationally recognized for its gemological laboratory. GIA certifies each diamond by authenticating a few characteristics that are absolutely vital to its overall value. 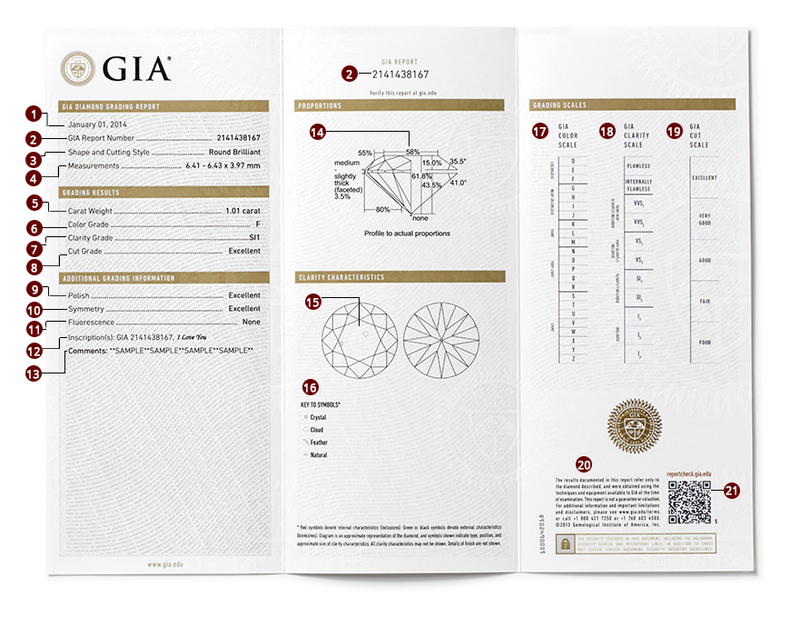 The GIA Certificate contains unbiased assessment of diamond’s 4C’s (Color, Clarity, Cut, & Carat Weight), graphic representation of the diamond’s proportions, and a plotted diagram of the diamond’s clarity characteristics. GIA Grades only natural loose diamonds and weight 0.15ct or more. View our breathtaking Emilia Petite Diamond Engagement Ring to see a stellar representation of GIA certified diamonds in a ring setting. 2- GIA Report Number: Unique number registered in GIA’s extensive global database, which is the same number inscribed on the diamond’s girdle. 3- Shape and Cutting Style: Diamond shape (Round, Oval, Princess, Cushion, ...etc) and the diamond cutting style or facet arrangement (Brilliant, modified, Excellent, ..etc). 4- Measurements: Diamonds dimensions listed in millimeters.For Round diamonds, measurements are listed as ( smallest diameter-largest diameterxdepth). 5- Carat Weight: diamond weight given in carats, recorded to the nearest hundredth of carat. One carat is equal to ⅕ gram. 6- Color Grade: Rates absence of color in the diamond, from colorless to light yellow or brown when you compared to a master colorless diamonds. Diamonds color scale starts from D (colorless) to Z (Yellowish, relatively to colorless stones). If “*” is next to the color grade, a color treatment was detected. 7- Clarity Grade: Rates absence of inclusion and blemishes. Diamond clarity graded on a scale from Flawless to included, based on size, nature, number, position, and relief of characteristics visible under 10X magnification. 8- Cut Grade: Evaluates quality and craftsmanship of the diamond cut. Diamonds are examined face-up. Cut graded on scale from Excellent to poor. 9- Polish: Examines the smoothness of the diamond’s surface. Graded on scale from Excellent to Poor. 10- Symmetry: Evaluates the exactness of diamond’s outline, shape, placement, and alignment of its facets. Graded on scale from Excellent to Poor. 11- Fluorescence: Level of glow and color of the diamond under ultraviolet rays (such as black light). 12- Inscription(s): Texts, symbols, logo, or numbers inscribed on the diamond’s girdle. 13- Comments: Any additional descriptions or features that are not mentioned on the report. If the diamond was gone under any sort of treatments, such as laser drilling, it would be represented in the comments section. 14- Proportion Diagram: Graphic representation of the diamond’s proportions. 15- Plotted Diagram: Graphic representation of the diamond’s clarity indicating the type, position and approximate size if clarity characteristics. 16- Key to Symbols: Lists the characteristics and symbols shown in the plotting diagram, if present. 17- GIA Color Scale: Representation of GIA Scale of diamond color grades. Available from D to Z. 18- GIA Clarity Scale: Representation of GIA grades of diamond’s clarity. Available from Flawless to I2. 20- Security Features: GIA microprinting , security screens, watermarks, a two-dimensional barcode, a hologram, and sheet numbering safeguard report integrity and facilitate document authentication.